Enjoying a relaxing breakfast near the beach. Layer statement necklaces over a nautical top for an effortlessly fun look. Keep the hair and make up fresh and feminine. 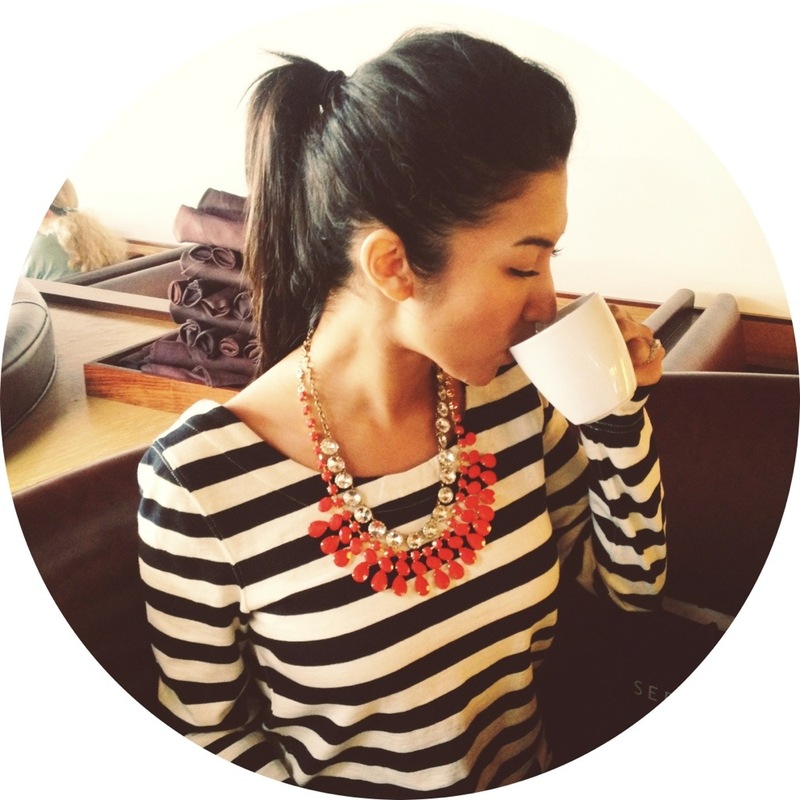 ABOVE: SHIRT: J Crew // NECKLACE (crystal): J Crew // NECKLACE (coral): Forever 21. 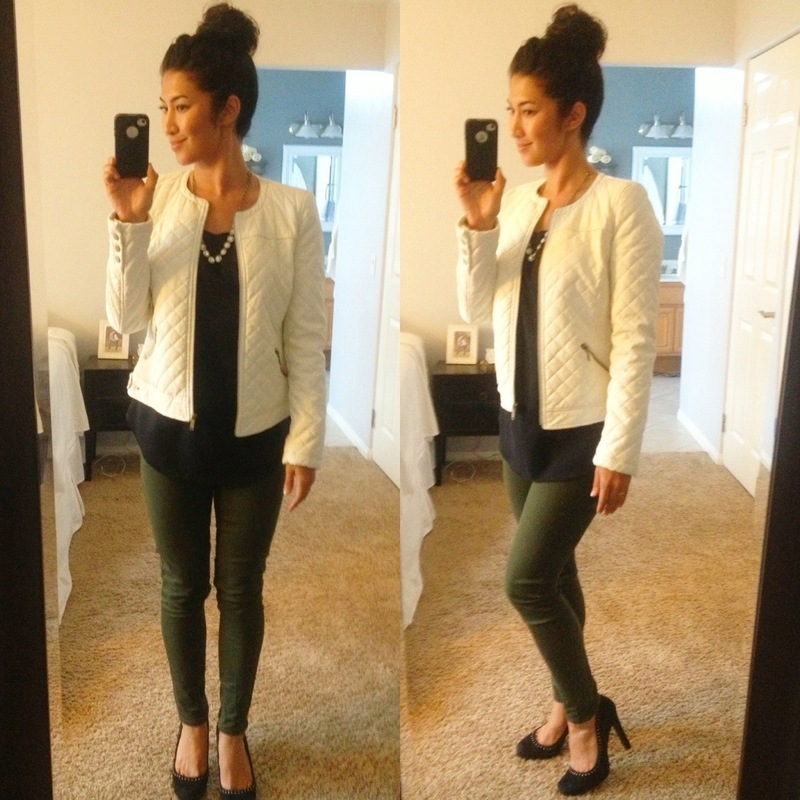 Today I wore this quilted white leather jacket, black top, army green pants and heels. The weather was finally cool enough to wear this glam jacket; I like the zipper pocket details and wrist buttons. I accessorized with the “J Crew Venus Flytrap Necklace.” Hope this gives you an idea for your next casual, fun outfit! Hair, make up or outfit questions? I would love to answer them! 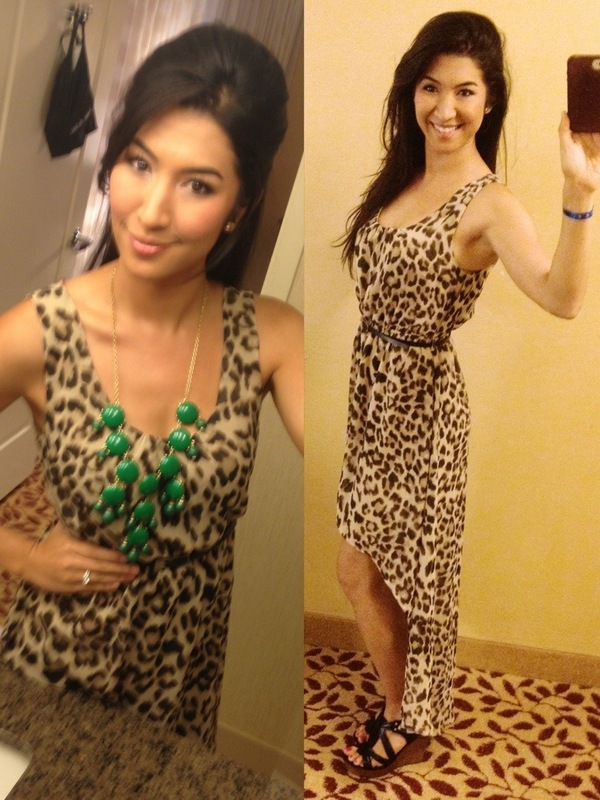 Above: Dress: Forever 21, hi-lo chiffon leopard tank dress, Necklace: J Crew, bubble necklace in Kelly green, Shoes: Steve Madden, Tampaa in black. This was a really fun day dress! To shift into evening I added the J Crew Bubble necklace*, and revamped the hair and make up a little. I had a work event, and people went wild for this outfit (no pun intended). It’s so easy to pump up an inexpensive dress from Forever 21 with some fab accessories and styling. The necklace was the perfect pop of color. I had to walk all night, so wedges were the clear choice! Hope this gives you some ideas for your next day dress look. What are your favorite accessories to take an outfit from cute to FAB? 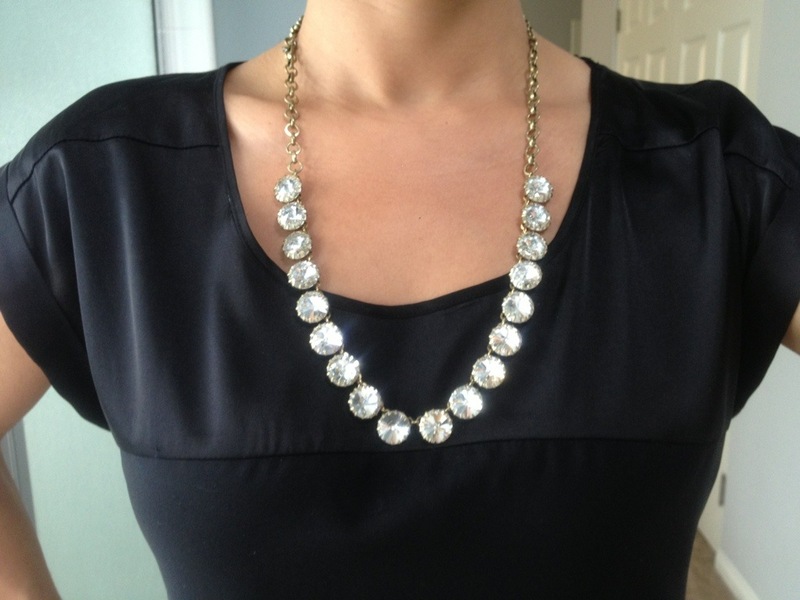 *J Crew Bubble necklace: I have one of these from amazon.com, and one authentic J Crew (pictured above). Get the real one, it’s WORTH IT! My other one is pretty, but it doesn’t even compare in quality. I’m all for a great “replica”- but I have yet to see a good one of this piece. If you don’t want to pay the hefty price tag on this necklace, get it barely used and truly authentic on eBay. That’s what I did! It was a steal! In case you want to know the giveaway of the imitations on eBay: the hardware holding the bubbles on. It’s a different shape than the J Crew hardware.